How can a season finale act as final closure and a confusing new beginning at the same time? Only Adam Horowitz and Edward Kitsis can manage this kind of crazy and beautiful ending for Once Upon A Time. They were able to rewrite their entire series in a two-hour finale, finalize the series, and create an open ending to allow the show to continue for a seventh season. Most of the finale is quite confusing, and it doesn’t provide closure until a great, approximately five minute, second-to-last scene of the episode. However, where we go from here is very sketchy and doesn’t make sense at the moment since almost the entire cast exiting the show. For everyone’s sanity, this is a very brief summary of what the final battle turned out to be: Essentially, the curse that the Black Fairy cast at the conclusion of Hook and Emma’s wedding took Emma’s family, excluding Henry, back to the Enchanted Forest to the time immediately prior to Snow and Charming’s wedding. Emma, Henry, Rumple, Gideon, and the Black Fairy remain in Storybrooke with the rest of the background characters. The curse brings Storybrooke back to the state it was in during the first Dark Curse — i.e. no one knows their true selves. The Black Fairy has taken on Regina’s original role as mayor and Henry’s second mother. The ultimate goal of the first phase of the final battle is for the Black Fairy to destroy Emma’s belief and hope piece by piece until it doesn’t exist anymore. This also will destroy each of the story realms that exist in the Once Upon A Time universe (Arendelle, the Enchanted Forest, Neverland, Oz, Wonderland, etc.) because the savior’s belief in magic keeps them all “alive.” Henry and Rumple are the only two characters who are awake during the curse, other than the Black Fairy, just like in the first season. So Henry is back to square one and has to make Emma believe in magic again. Phase one of the final battle is a back-and-forth between Henry and Emma’s views of reality. When Rumple realizes the full truth of the situation and that the Black Fairy is still controlling Gideon, he takes a huge step by killing his own mother to try and stop the curse. By killing the Black Fairy, the curse is broken, everyone regains their memories, and the Enchanted Forest folks return to Storybrooke. Unfortunately, phase two gets set off by the Black Fairy’s final action of commanding Gideon to kill Emma, thus light destroying light and darkness prevailing. Phase two doesn’t last very long, but we do get a bit of the prophesized final duel between Gideon and Emma. In a great bout of character development, because it takes two saviors to save everyone. Emma has to force the ultimate sacrifice in attempt to try and overcome the Black Fairy’s spell on Gideon. Rumple also tries to save his son, but is plagued by the literal devil inside him. With some excellent split screen work, both Rumples have a moral battle over whether Gideon should kill Emma or not. Rumple’s newfound good side ultimately wins out, as he tries to do the right thing and command Gideon not to kill Emma. Even though he can’t break the Black Fairy’s magic easily, Rumple doesn’t give in to his darkness. I like to believe that a combination of Emma’s sacrifice and Rumple’s change of heart allow Emma to overcome being stabbed in the heart by Gideon. Rumple’s role reversal causes a chain reaction of two further reversals. First, Emma is knocked unconscious and is unresponsive until Henry’s true love’s kiss wakes her up. Second, Gideon is turned back into a baby and is given a second chance at life. There are also two other role reversals thrown into the Enchanted Forest during the curse. After falling from a beanstalk, Charming is awoken by Snow in the same manner as the first season original true love’s kiss that awoke Snow from the sleeping curse. They even use the same exact dialogue to reimagine the moment. It’s another funny nod to the first season of the show, which was the ultimate point of the finale. The second reversal was the Evil Queen living in the Enchanted Forest and proving to Regina that she has changed by giving the other characters more time to escape the destruction of their realm. The Evil Queen sacrifices herself to save everyone else, proving yet again that redemption is possible. She is eventually rewarded with coming back to life, so everything comes full circle. The role reversals are symbolic in showing the purpose of the series, which helps bring the show back to what it was meant to be. The entire finale felt like a series rewrite, which wasn’t a bad thing. Series reboots and restructures are typically messy and contain difficult transitions. Horowitz and Kitsis did a great job of “rewriting” the history of Once Upon A Time over two episodes. The finale is an exact rewrite of the first season, which was really fun to watch play out. Everything should feel like déjà vu — even all the costumes are the exact same as the pilot. It’s funny to see all the characters back in the same place as they started, which provides for the full circle closure that was promised. The season finale was written as a potential series finale, since the fate of the show wasn’t revealed until May 11th. The rewrite of the original tale allowed the show to get back to its roots, which is something that has been needed for some time. I felt that the show lost its original purpose about two seasons ago, so it is good to see that there finally is a light at the end of the tunnel. The ending of the finale surely points to a complete change in the series, but more on that later. The series rewrite is definitely vital to the show’s continuation, but not all was revealed in the finale. Along with the seventh season being greenlit, the week leading up to the finale brought the shocking reveal that most of the cast would not return. Jennifer Morrison (Emma), Rebecca Mader (Zelena), Emilie de Ravin (Belle), Jared S. Gilmore (Henry), Ginnifer Goodwin (Snow White), and Josh Dallas (Charming) will not be returning next year. However, Morrison said that she is contracted for one episode, and Goodwin and Dallas may be back in guest roles occasionally. The only returning main cast members are Lana Parrilla (Regina), Colin O’Donoghue (Hook), and Robert Carlyle (Rumple). Here’s the problem: there’s not a full set-up in the finale for what’s to come next and how the remaining three characters will become separated from everyone else. Seeing as none of the main cast was killed off in the finale, they all still live happily in Storybrooke. The beautiful montage that follows Emma winning the final battle was the perfect way to end the series, since all the characters have completed their arcs and have found their happy endings. Honestly, even though I am a very loyal fan of this show, it may have been a better move to end the series right there instead of moving forward without the whole cast. I don’t think Horowitz and Kitsis could have written a better ending to the series, and with that ending, it doesn’t make sense for the show to continue on. But since the show IS continuing and all the characters are still alive, it seems that they all have to show back up in the first episode of the seventh season to provide the reasoning for why Regina, Hook, and Rumple will be the only ones leading the pack. It doesn’t make sense to only have Emma show up, if the season premiere is the episode Morrison is contracted for. There have been no reports on whether anyone else will return for an episode at this time, but how else can they launch the new storylines without paying the earned respects of the original characters? I don’t think the season finale was the final goodbye for every character, but with Once Upon A Time, anything goes. With that being said, what is known about the future of the show? Virtually nothing! Other than the three returning cast members, Andrew J. West and Alison Fernandez will be joining the show. Purely based on the last ninety seconds of the finale, they will be playing an older version of Henry and his young daughter, respectively. Yes, it got that wacky and confusing by the end, but it wouldn’t be Once Upn A Time without one last screwball. I swear that Horowitz and Kitsis are not pleased until every person watching the show is staring at the screen in disbelief and scratching their heads, trying to figure out what the heck is going on. And hence, the full circle rewrite/reboot of the entire series! 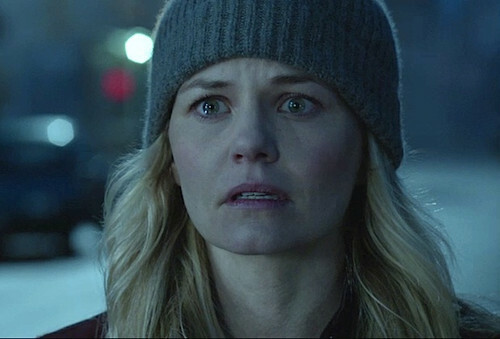 The final scene of the finale mimics the introduction of Henry to Once Upon A Time in the pilot when he knocks on Emma’s apartment door in Boston and tells her that he is her son. There are infinite questions as to what is happening and how/if this is how the series will continue, so I can’t even begin to dissect every possibility for what this scene means. It felt like the series ended and then was reborn out of thin air within two minutes. The finale was a great two hours that really brought the season to a nice conclusion. I have no idea how the show will be sustained for a seventh season, but I look forward to hearing what Horowitz and Kitsis have to say about the reboot. Also, Horowitz and Kitsis need to write all of the episodes from now on for the show to have a chance to get back to where it once was.